Love is in the air this week and what better way to celebrate than by rambling through the land that practically invented romance? Become doe-eyed in the home of Chianti, lose yourselves along Tuscan hills or become the stars of your very own Renaissance painting. For a romantic getaway with a difference look no further than the fantastic Via Francigena. What better way to uncover beautiful Tuscany than on foot? Rove across rolling green hills and lush vineyards, marvel at medieval architecture. On this section of the Via Francigena walking from San Miniato to Siena there is a new treasure to be discovered each day with world class Italian cuisine to fuel your journey. This is a hiking holiday to suit everybody’s needs with relatively short distances and little elevation to allow you to take your time and enjoy every moment just like an Italian! The final section of the Via Francigena from Viterbo to Rome, takes you ambling through the idyllic Lazio countryside and down Roman paths, across bountiful orchards of orange and lemon and lush olive groves on your way to one of the most iconic cities on the planet. Lose yourself in the streets of Viterbo and Sutri and be transported back in time through the many historical sites en route. You’ll finish your week’s walking in the eternal city, tucking into the world’s best pizza washed down with a glass of Chianti. 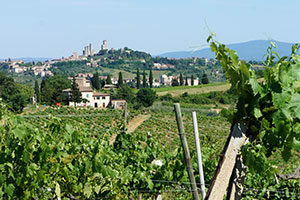 Perfect for lounging lovers looking for a relaxing cycling trip, we recommend an easy 8-day cycle from Lucca to Siena. The tour includes 6 cycling days, covering between 14km and 27kms per day. This tour is suitable for all levels. You will have plenty of time to explore historic towns and villages along the way and enjoy a leisurely lunch break. For more details about the Camino to Rome or to request a quote contact our travel specialists.